It’s not too often that I am actually surprised by things I come across in that bizarre social catch basin known as “Twitter moments,” but this was definitely one of them. And granted, this one is still up for debate. 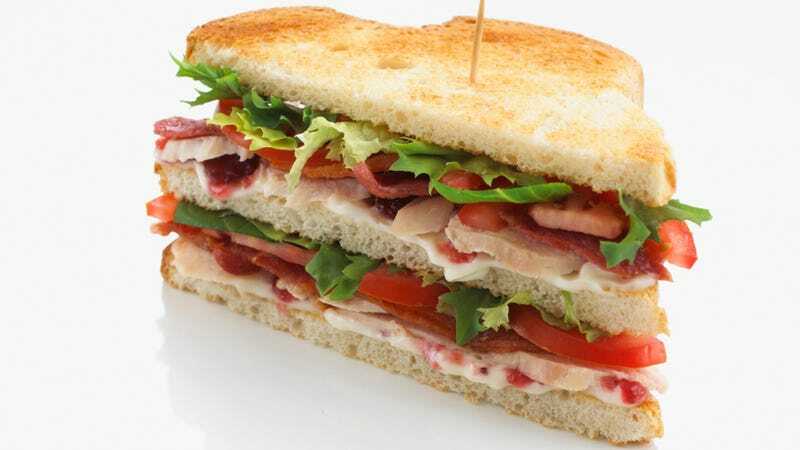 Like many of you, I always believed that the club sandwich was created at some fancy country club somewhere, all the better for the rich people to enjoy their toasted white bread slathered with mayonnaise and piled high with chicken, lettuce, bacon, and tomato. Ideally sliced into triangles, with another piece of bread snuck in the middle there, all held together by an ambitious toothpick. Sure enough, clubs like a gambling club in Saratoga Springs, New York, as well as the Union Club of New York City, take credit for creating the now beloved club sandwich, short for “clubhouse.” But a new (or newly discussed) theory is floating around that the “club” is actually an acronym, standing for “chicken lettuce under bacon.” Consider my mind appropriately blown, and I’m not alone. On Twitter today, this debate ranks right up there with the blue/gold dress and the Yanny versus Laurel skirmish of yesterday: Is “club” an acronym or not? As Quora, it says no; ask Abbreviations.com, it’s a definite yes. Given what is actually on the sandwich, the acronym certainly makes sense. But given where the sandwich is often eaten, the traditional definition of “club sandwich” fits as well. Maybe—and just hear me out—the savvy title for this sandwich works both ways? Wait, can you copyright a sandwich?